Innovation is not just for products and services. The best teams also find innovative ways of working together to support them in producing game-changing work. There are many great examples of collaboration techniques and rituals that successful companies have used to support an innovative culture – Pixar’s Braintrusts, Etsy’s Blameless Post-Mortems, Amazon’s Two Pizza Rule, Google’s secrets for effective brainstorming to name just a few. It’s tempting to want to copy these ideas, but these final versions may only be part of the story. These ways of working may have come about through a process of trying and tweaking that is specific to the company, their people and their environment. You can certainly try them, but it’s likely that they’ll need to be adapted for your context. There are two reasons not to just copy techniques straight over. Firstly, there is no one-size-fits-all for teamwork. Every team is unique because of the individuals on it, the culture they create when they come together, what they are working on and the external factors that affect their work. What works for one team may not necessarily work for another. Secondly, changing behaviour is difficult. It’s hard enough trying to change our own individual behaviour – creating good habits and breaking bad ones – let alone doing it at a team level. While it’s necessary to have a bigger goal of working better as a team, that goal needs to be broken down into smaller units of actions and behaviours to make it happen. The good news is that innovating the way that you work uses the same skills that you use every day in creating great work for clients and customers, and generating new ideas. The skills involve: identifying problems, creative thinking, exploring possible solutions, designing experiences and experimentation. What does great teamwork look like? Get your team on the same page about what you are aiming for. How would you like to work as a team? What do you need to achieve and get done together? How do we do our best work? 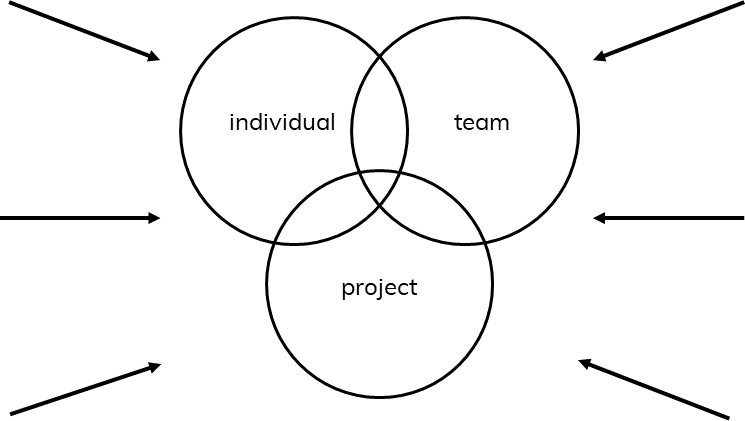 Better teamwork first starts with understanding individual working styles and preferences. When does everyone feel their most creative and productive? In what environment do you all work best? Where do you each need support? How do we currently work? Explore and map out your team’s current working patterns. When are your regular meetings and what happens during them? What happens in between meetings? How do you communicate and share information? What would we like to change? Identify areas for improvement. What causes frustration on your team? Is there anything that slows you down, or causes you and your colleagues to feel rushed? Do any meetings feel unnecessary or that they have outlived their purpose? The Value Proposition Canvas was created by Strategyzer to help companies build better products and services for their customers. The Customer Map (the right-hand side of the canvas) is also a great way to explore the challenges that your team is facing in doing your best work. Gains (what you enjoy and positive outcomes of doing your work). This exercise helps you to get a build collective empathy, uncover any assumptions about what your team is doing and create a common starting point for designing better ways of working. A framework to audit your current ways of working. Ask everyone to brainstorm their ideas for each heading individually onto post-it notes and then stick onto a flipchart or whiteboard divided into the three columns. Group similar post-it notes to find themes and the most popular areas for your team to improve. To increase the chances that a new behaviour will stick, it needs to be broken down into its smallest part, a micro-action if you like, that takes the least amount of effort to perform (also see Fogg’s “Tiny Habits” programme). 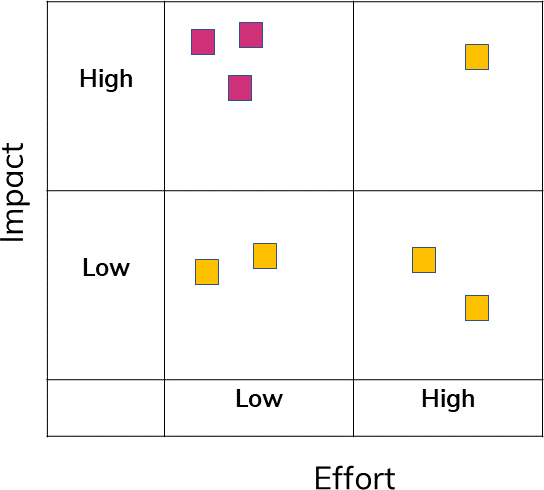 By using the impact/effort matrix, you can identify new behaviours and actions that will be easy for your team to implement but reap the biggest rewards or initial quick wins. Start with an open-ended question like “what can we do to improve our teamwork?”, and ask everyone to generate ideas for how the team can change (first individually on post-it notes, then in small groups to build and shape the ideas further). Arrange the ideas onto the impact/effort matrix to highlight which ones will have the most impact with the least effort. The goal is not to find the perfect way of working immediately, but to narrow down the ideas to something you can start and experiment with. Aim for something lo-fi that can be tested within your team’s existing resources and doesn’t add too much to your workload. The outcome from these kinds of discussions is two-fold. As well as finding specific team behaviours to improve, you’re also building the team habit of building team habits. Your team is developing the skill of having conversations about how you work together. It’s an ongoing process. Any team that wants to keep producing innovative work must also be working innovatively to achieve those results. It’s a shift from being passive about working methods, to being proactive in designing teamwork for the results we want. What ideas have you put in place to innovate your teamwork?